Can you tell it’s tomato season? Fresh tomatoes are the best. But I’ve been over that already. Last week was Week of the Free Tomatoes for me (I passed by a yard with free tomatoes on my way home and on of my farmer friends had extra that she gave me as well), and I think I have made good use of them. I will have you know that I didn’t even think about making pesto from fresh tomatoes (sundried tomatoes, yes, but never raw), and then I came across this recipe is from Food 52 and I had to try it. It is more watery than normal pesto, and actually I couldn’t decide about it at first, but it’s one of those dishes that tastes better as you eat more of it. I am now a big fan. It also dovetailed nicely my freezing of tomatoes, which I will also share here. This is also convenient for you dairy-free folks out there (Mother), since it doesn’t have cheese but remains very creamy. I admit that it benefits from a sprinkling on top, but that can easily be substituted by some toasty breadcrumbs, or even something like nutritional yeast if you’re into that (I wasn’t born in the 60s and had no idea what it was until fairly recently; not really my jam but I can see the appeal). Tomatoes in this recipe do need blanching to remove the skins (not that you have to blanch them to do this, it just makes it énormément easier; also really you could make it with skins on, you’d just have tomato skins clunking up your pesto and it might get caught in the food processor blade). If you’d like, do a bunch at the same time, and then freeze the rest! I was thinking about canning them but don’t have a pressure canner and it seems like more work and safety concern, so I went with freezing (for now). 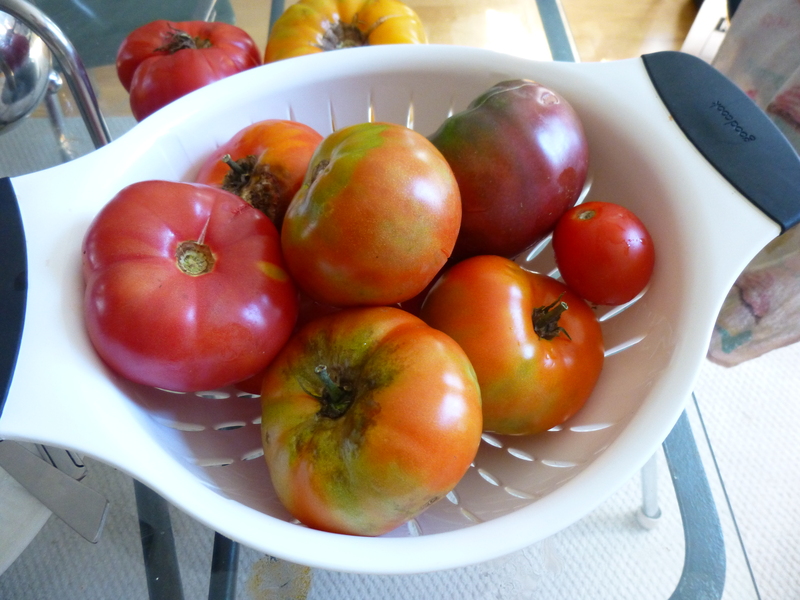 Often tomatoes are cheap this time of year in bulk, especially if you get ones that are not absolutely perfect (i.e. don’t sell as well at the market but are still great). They might be what I am most excited about in my freezer right now. I was at the grocery store today to do some price comparisons and you can get tomatoes for cheaper there but I’m not convinced they would taste like anything at all. And they looked a little grayish. Like I’ve said before, Backyard Farms does have pretty great hothouse tomatoes, but they were not cheaper than ones at the farmer’s market, so save them for winter emergencies. What I’m trying to say here is, it’s worth it to eat seasonally. You might not enjoy fresh pesto tomato toasts in the winter, but instead you can savor rich tomato reductions over pasta or in chili. And by preparing now, you can save yourself money and disappointment (over lackluster store-bought sauce, which is a real thing although the phrase sounds a little tropey to me at this point) later. Boil water in a large pot. Score the undersides of the tomatoes (cut a little x on the bottom). Prepare a large bowl of ice water if you have time. Put the tomatoes carefully in the boiling water only for about 1 minute (you will probably want to start taking them out before the minute is over, because it takes some time if you only have a spoon, or even with a small strainer—I wanted to keep the water to cook pasta later, so I didn’t pour everything into the sink, and anyway that might damage the tomatoes). Place them right into the ice water. The skins should now peel off very easily. Core the tomatoes and carefully squeeze out the seeds and juice into another bowl (I followed this guide). Reserve this juice for later. 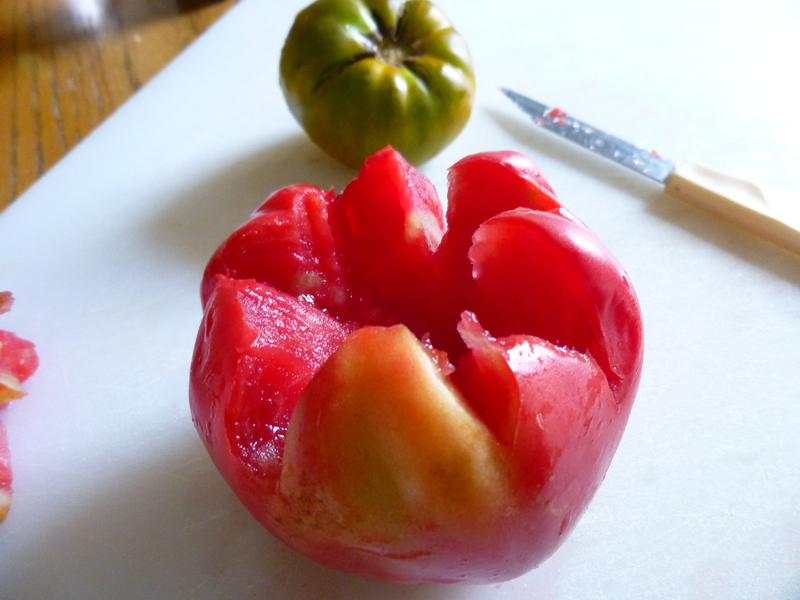 You should be left with reasonably un-watery tomatoes; let them drain more if you can. For freezing, put them in a freezer bag (maybe 2/3 full), get rid of all the excess air, seal it up, and put it in your freezer. The Kitchn also notes that you can just freeze whole tomatoes, although I don’t have room in my freezer for that. Tomatoes for the pesto should be chopped a bit. If you don’t have time for blanching, etc., and you don’t mind skins, I suspect it would still be delicious. Do squeeze out the juice though, or it will be too watery. Toast the almonds (nuts always need to be toasted. It releases all the flavors and makes everything better. I generally toast a bunch at once, because that way I don’t have to turn on my oven every time I need them for something like this). 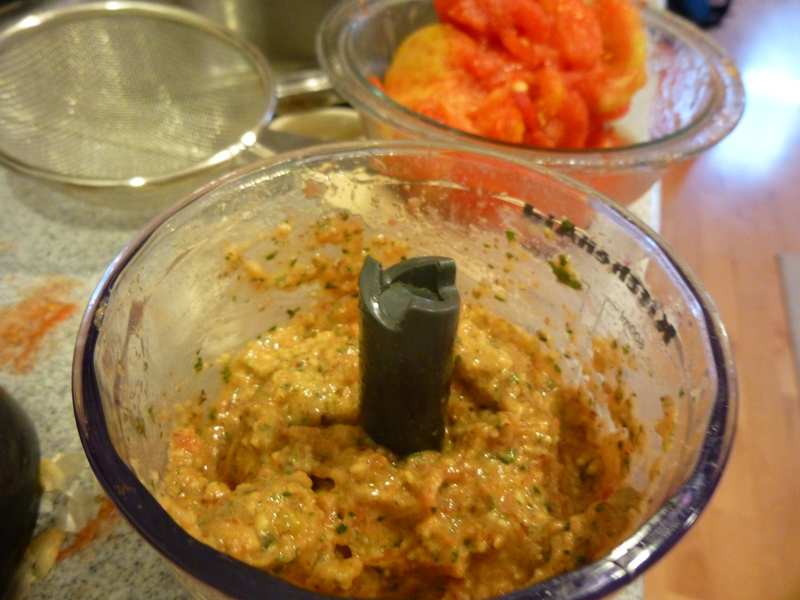 Grind up the almonds and garlic in a food processor (traditionalists will stick to a mortar-and-pestel, but I don’t have one so I guess I risk blade oxidation) until pretty small but not into a paste (almond butter is delicious, but not the goal here), then add basil and chop a bit. Throw in the tomatoes and some olive oil and pulse until your desired texture—some chunks of tomato would be fine, but it is also good nice and creamy. Serve over pasta, on toast, you know the drill. Actually this is particularly good over some gently sautéed or crispy kale. What do you do with all the extra tomato juice?? This may be better than the actual pesto. If you like green smoothies you can add it to that, or just strain it and drink it. A friend of mine also suggested that tomato juice is useful for bathing a cat who has been sprayed by a skunk. For those of you without cats to worry about, and those who are willing to take a very small risk for something fantastically delicious, I recommend simmering it on the stove for a long time, straining out the seeds as you can/feel like it and reducing it a whole bunch. This tomato reduction is PACKED with flavor, is truly amazing, and can then be (guess what) frozen. I’ll let you know when I use it, but my guess is that it will be a replacement for tomato paste. Make sure you label and date everything in your freezer. Saveur posted A Celebration of Pesto the other day and due to a (somewhat…) inexplicable theme of this blog, I feel the need to share it with you. Additionally, although this is not exactly in line with seasonal/healthy vegetable food like most of my posts, as a single-person household I do appreciate the simplicity of cooking in a mug, as was featured on NPR. I wouldn’t call this bruschetta. But I guess it’s similar. More like an open-face sandwich maybe. Anyway, a fantastic way to celebrate those glorious tomatoes that are at the market these days (by far my favorite time of year for produce. SO MANY COLORS. Is great). One time a couple summers ago I was so inspired by the tomatoes I went out and bought a gallon of milk to make fresh mozzarella, which is surprisingly easy (as long as you can find raw or at least unpasteurized milk). At some point I shall share some cheese-making adventures with you, although it’s been a little while. Thinly slice and quickly sauté the zucchini, if using. Toast the bread (unless you have ridiculously fresh bread). 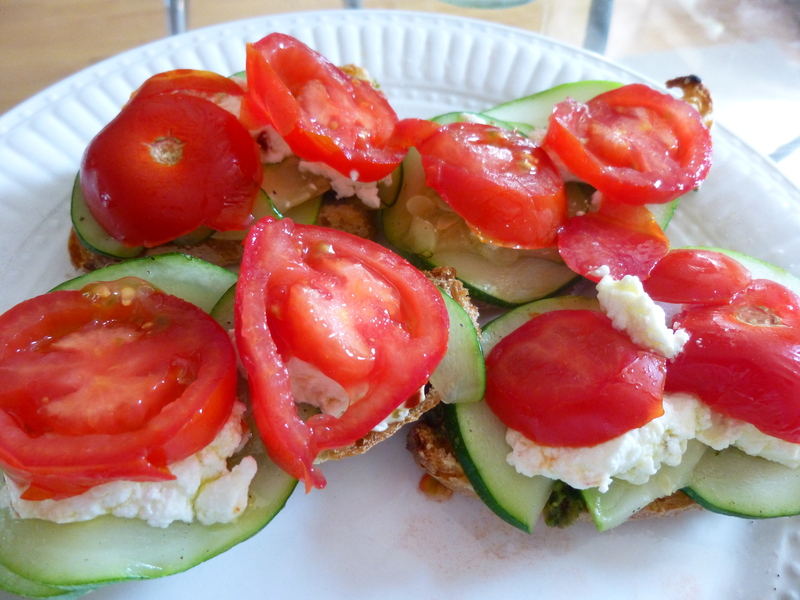 Spread with pesto, then zucchini, cheese, and tomatoes (I like this order because otherwise the tomato juice can make the bread a little soggy). You can also drizzle with a little balsamic vinegar if you want. Admire, then stuff into your face. 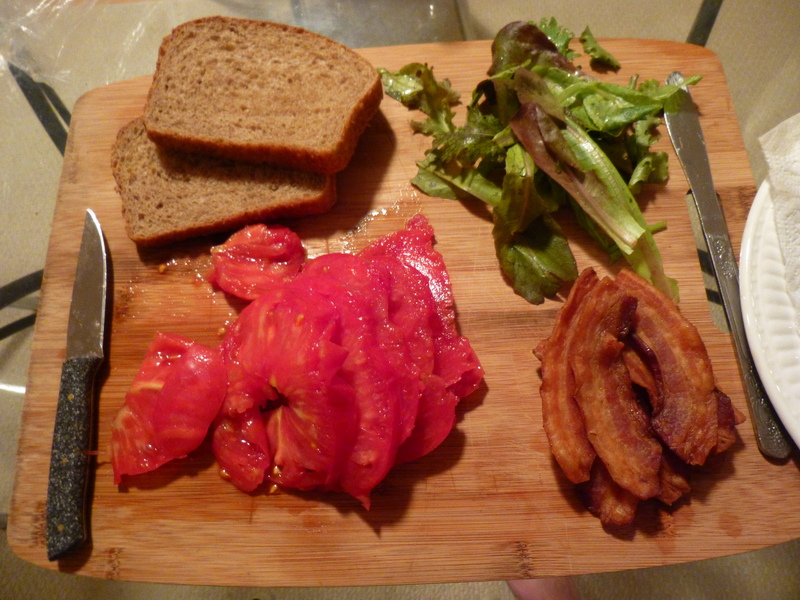 A BLT is another fabulous medium for those fresh tomatoes. I really don’t think I need to give you a recipe for those… B, L, T. ‘Nuff said (just make sure you get good quality ingredients). P.S. Check out my new paring knife—my other one broke (it was a bad day) and so I have attained a new one with the help of my father. Good knives are essential to successful cooking. Shiny, yes? If you are keyed in to local food in Maine right now, you are probably up to your ears in garlic scapes. Which are these funny little green snake-like fronds that I have never seen in a grocery store. You can find them at farmer’s markets wherever anyone is growing garlic. They are the shoots from garlic (more about them here if you are interested), and they’re only out for a couple weeks, but they are quite delicious. Garlicky, but fresher. You will not be surprised to hear that I make them into pesto. Well, pesto is really the best thing to do with them, although I’ll include a few other suggestions at the end. If you’ve been following me, you should know how to make pesto by now. But I’ll throw on a recipe anyway just in case. I like to make is with pistachios rather than pine nuts because they’re a little sweeter. And if you don’t like a strong bite you can cook them just a tiny bit before grinding them up (I wouldn’t though – part of the fun is the sharpness. And it will mellow out with time. Or if you warm it up at all). 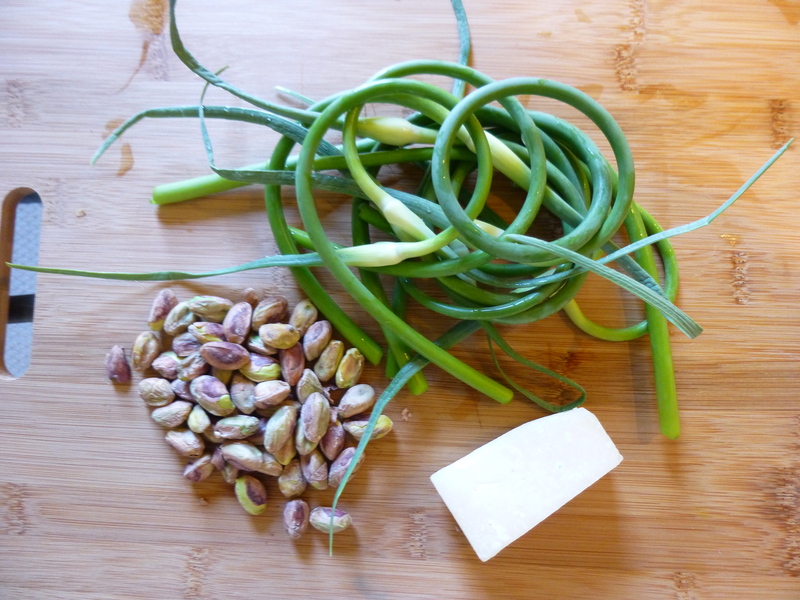 Start by putting the scapes in a food processor and grinding them up a bit by themselves. They can be a bit hard and might take longer than the other ingredients. Then add everything else and blend, tasting, adjusting, and blending more as needed. This is particularly good on pizza. And of course edible on pasta and a huge variety of other things. Freeze whatever you don’t use to be a ray of sunshine in the winter. 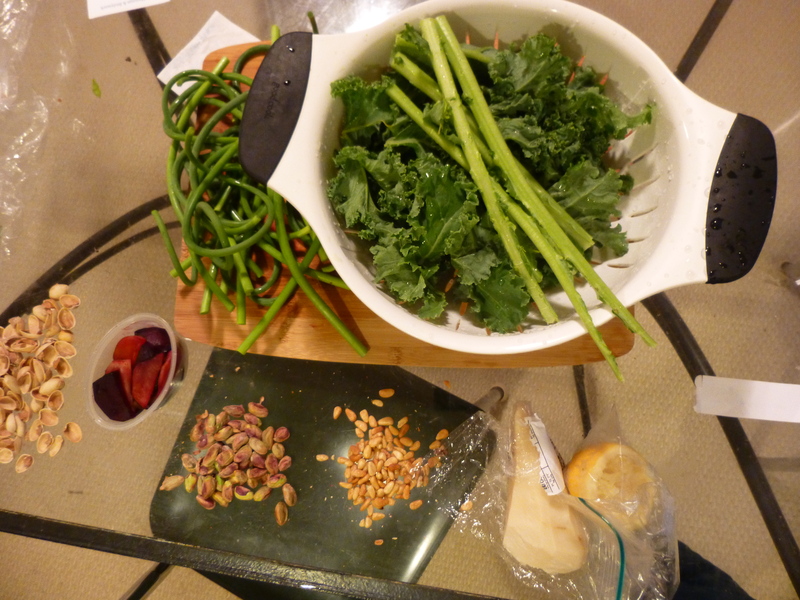 You can also mix in some kale to make kale-scape pesto! Pesto is all very nice, you might say, but what else can I do with these things? Try cooking them. They taste shockingly sweet and make a nice side dish (whether grilled or sautéed), maybe sprinkled with some fancy salt and olive oil or a little cheese (this is sounding a little too much like pesto ingredients…). Pic kles! I am giving this a shot. 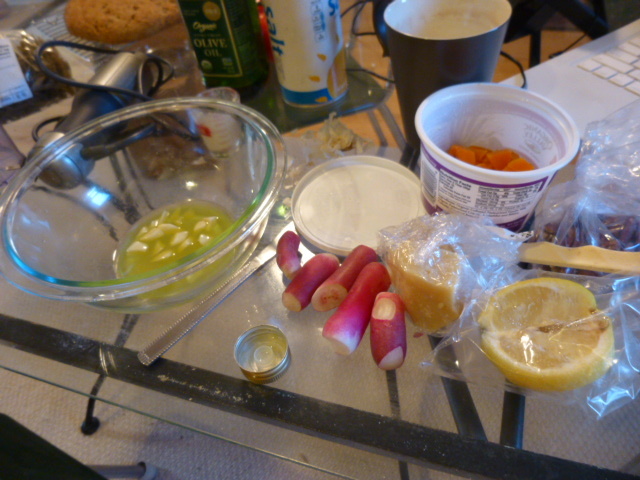 I used this recipe although I have never pickled anything before in my life. And I don’t even like normal pickles, one of the few foods leftover from my childhood picky-eater-ness. But, I’m super excited about these. Put them in things. Omelettes (nom), other veggie dishes, salad dressings, salads, humus, egg salad, on pasta… whatever you would do with either garlic or asparagus. Which are not that similar. All part of the Amazing Scape Versatility. Aren’t they fun? UPDATE: Food52 also published some great suggestions, find them here. Well, I’m still behind on posts but I think I’d better post them in the correct order, because some of the ingredients are grouped. Remember the kale butternut squash pizza we made? Well, this is something else to do with your kale, and extra squash if you have it from that. I realize this is my second pesto recipe in a total of 4 posts. No shame. As I said before, you can put anything in pesto, and it is delicious. I had a friend over the other day to make garlic scape pesto (post coming), and I took out some arugula and kale pesto to do a mini tasting. This one is her favorite. So. Kale on its own isn’t super flavorful. I like it, and it’s all the craze right now, but I feel like pesto needs a little more pizzazz. However, I had a lot of kale and I still wanted to make pesto; it just required a few more additions: spicy radishes, because I had too many of them too and they add some zing, and the squash I had leftover from the pizza. I guess that’s kind of the way I like to cook – what do I have, how can something delicious come out of it. It’s like a puzzle. Some things don’t work out, but I’m proud of this one. I realized I haven’t yet told you how to strip kale. Hold onto the stem with one hand (I usually use my right), then hold the base where the leaves start between your hand and your thumb (I don’t know what to call that area between your thumb and your first finger). Pull away with your right hand, and the stem should separate easily from the leaves. If that isn’t a good description, which is may not be, here’s a video that does basically the same thing. I like using the stem (because why throw it out when you can eat it), you just have to start cooking it before adding the leaves. It helps to chop it up first (this is true generally as well as for pesto). I blanched the kale before adding it – I think you could probably make pesto with raw kale (depending on variety), but blanching makes it a little more tender. To do this, boil and salt water, and put the kale in (stems first for a few minutes by themselves) and boil it for anywhere from 30 seconds to a few minutes, just until it is tender. Be ready with an ice bath, or just some cold tap water to run over it (I can’t be bothered to get out an extra bowl and besides, I didn’t have any ice) to stop it cooking. Once the kale is cool, combine all the ingredients in a food processor (see Arugula Pesto to hear me rave about my Kitchen-Aid hand blender food processor). Process, scraping down the sides a few times. Taste and adjust ratios as you see fit. I highly recommend this in a cheese melt (bread-pesto-cheese-oven). It is also delicious on pasta, like most pestos. Not bad mixed with arugula pesto, actually. Half the extra goes in the fridge for the week, the rest in the freezer for the winter. Although you could make this when it is not summer as well, unlike other pestos. Apologies for the somewhat blurry photo – I’m working on my photography skills. I have so many things to tell you I don’t know where to begin. So I’m just going start with today, and we’ll see where we go from there (if you’d like a little more of an intro, I just updated the “About” page). I picked up Week 2 of my CSA (community-supported agriculture, a farm share, for those of you who will be learning from this blog; more on that later) today. Mesclun, arugula, chard, cilantro, garlic scapes (which I’m extra thrilled about), radishes, Chinese cabbage, and an fantastic surprise, strawberries. Which were pick-your-own and I ended up with a huge rash which I hope is from the straw and not the berries (yep, it took me a while to make that connection too, but the bushes do grow in straw beds). 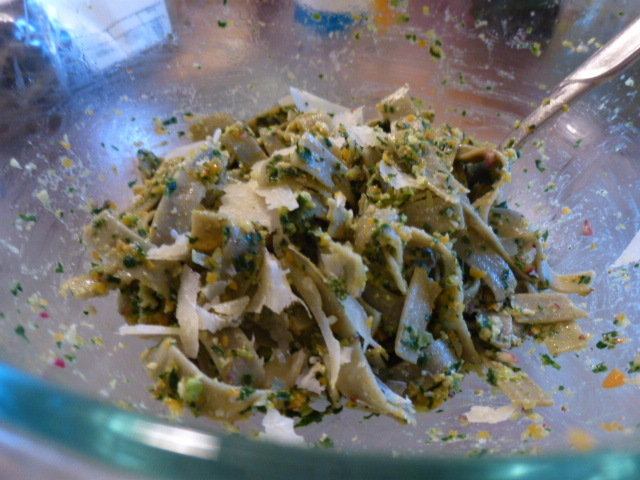 Anyway, since I still had some arugula from last week, I decided to make one of my favorites of all things, pesto. Pesto as I know it is basically some some of vegetable, olive oil, a hard cheese, some kind of nut (pine nuts are traditional for regular pesto, but other kinds work better with other ingredients), and garlic. It can be made out of pretty much anything, and is also super easy. I made kale pesto a few weeks ago, which I will tell you about soon, and plan to make garlic scape pesto, sundried tomato pesto, carrot top pesto, and of course classic basil pesto. Arugula pesto certainly has a stronger and I would say less coveted flavor, but it remains delicious and fresh and green and spreadable over pasta or on sandwiches with melted cheese, which is the whole point. Its bitterness also goes well with sweeter foods – I bit into a few cherries while eating and they added a nice balance. If you have dried fruit (figs go particularly well, my dad added them to an arugula pesto once) I would add them right into the pesto. I made it in my mini-hand blender food processor, which is pretty much the best appliance ever: a hand blender, with attachments for a food processor and a whisk too. I use it with shocking frequency for pesto, nut butter, smoothies, frostings… I definitely don’t want this to turn into an advertisement but it was the best birthday present to myself ever (I spent a while looking around for sales). However, a regular food processor will work as well or better (especially for larger batches, I had to do this in a few parts because the bowl of this one is small). 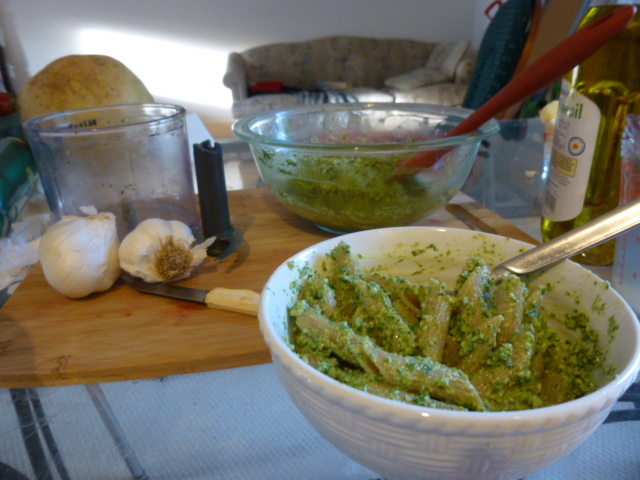 I’ve tried to make pesto with a knife before, and it can still taste good but it never gets as creamy. Cook the garlic in the olive oil in the microwave for about 15 seconds (you can also sauté it if you prefer, but the microwave works fine for this). Place everything in a blender together and whir away. Scrape down the sides at some point, taste, and maybe vary the ratios of oil or other ingredients depending on what texture and flavors you like best. You will notice that all these measurements are inexact. This is a) because I didn’t actually measure anything so I’m just guesstimating and b) to encourage you to decide what you like best. You can’t go too wrong. Cook up some pasta or make some toast and voilà! Dinner. 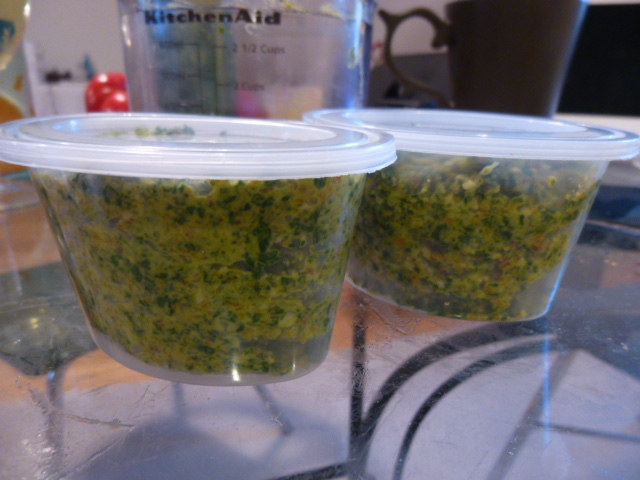 Pesto of all kinds freezes very well, so I like to make a fairly large batch and stick it in little labeled containers in my freezer for the wintertime. This is also useful if you are on your own and don’t want to eat buckets of pesto at once (it is easier to make in large batches). Although pesto tends to disappear reasonably quickly, since it has infinite uses (on pasta, grilled cheese, as a dip, mixed into salad dressing, etc). After I finished the pesto I did end up freezing most of my strawberries, first on a baking sheet and then into bags so they don’t stick to each other, so I can have them for the wintertime as well (I think I mentioned smoothies…). Don’t worry, I kept some out for breakfast and dessert. Nom.